How to get there: This mountain is located on the Jostedalsbreen glacier. This glacier is in Southern Norway, the village of Stryn is located on the north side while Sogndal is to the south. The best (closest) approach is from Bødalsseter (north) or from Fåbergstølen (south). 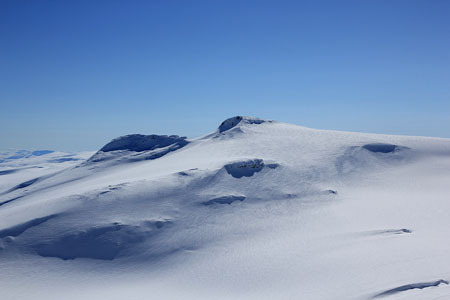 However, the recommended way to climb this mountain is to visit as a part of a skitrip across the main Jostedalen glacier. Route description: From the base of Lodalskåpa, ski southwest and west of point 1872. Turn east and follow the very gentle slope to the summit. A few reports on skiing across Jostedalsbreen are available. 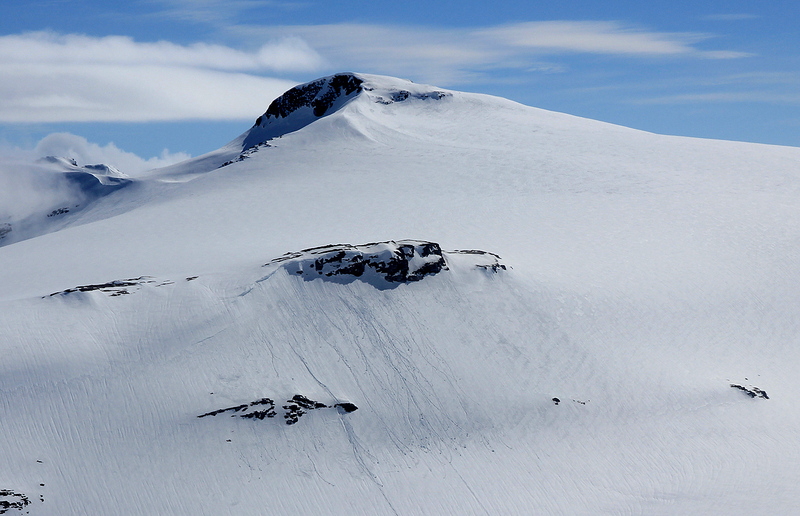 Comments: I climbed this mountain as part of a 3.5 day ski trip across the Jostedalen glacier. I had skied by this peak numerous times without climbing it, but on this trip it was decided to include a visit. We had camped near the base of Lodalskåpa (Ståleskar), the previous night. We broke camp around 0815 and skied in dense fog for about one hour. We then left our backpacks about one kilometer west of the summit and made an easy ascent on skis. Brenibba, as seen from the east flank of Lodalskåpa.